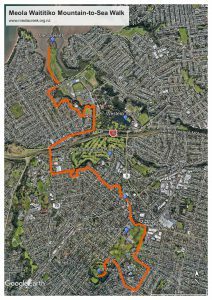 The Meola Waititiko “Mountain to Sea” walkway begins at Mt Albert Owairaka and follows, as closely as possible, Meola Creek Waititiko, until it reaches Meola Reef Te Tokaroa where the creek meets the Waitemata Harbour. As some of the creek is currently culverted, and more is difficult to access, the walkway follows roads in part. As STEPS is working toward more of the creek being accessible and restoring its natural state, the aspiration is that the walkway will improve over time, and become more tightly connected to Meola Waititiko’s journey from “Mountain to Sea”. A guide (map and instructions) is below. For a printable PDF of the guide, click here. The first street on your left is Ti Kouka Lane, turn left here. As Ti Kouka Lane curves to the right, it joins the headwaters of the Meola Waititiko. In summer and during other dry periods, this part of the stream is often dry. Follow Ti Kouka Lane until it re-joins Haverstock Road and turn left. Walk through the Reserve to the bridge where you meet the stream proper for the first time. From the bridge walk down the path on right side of the stream, into the Roy Clements Treeway, and follow the Treeway to Alberton Ave. At this point the creek goes into a culvert that flows north under Alberton Ave. This next section of the walk will approximately follow the culvert’s path. Turn right into Alberton and walk down to the intersection with New North Road. Cross New North Road into Rocket Park and approach the War Memorial Hall. Pass the hall on the left-hand side, and proceed through the upper car park (with the YMCA on your right) and down to the lower car park. A path to the north leads down off the carpark and on to the lowest part of the park. Once at the bottom of the steps, follow the wide concrete path. This path is actually the top of the box culvert that Meola Creek runs within. Follow this path until you reach a T junction, and turn left up the slope until you reach Asquith Ave. This will lead you away from the culverted creek, and it will remain about 100m to your right for the next section of the walk. 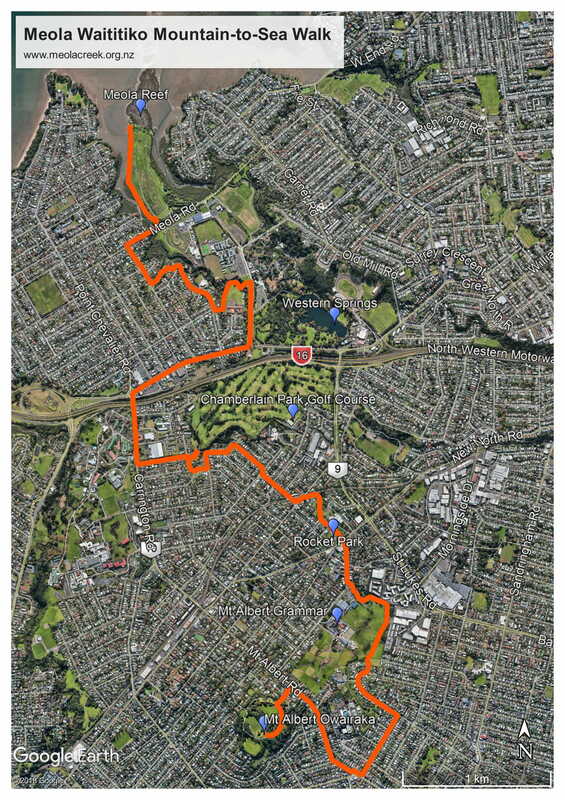 Turn right into Norgrove Ave and walk to the end, where the creek can be seen flowing through Norgrove Reserve. If you walk down the path in Norgrove Reserve you reach the point where the creek comes back out of the culvert. Return back down Norgrove Ave and turn right into Chatham Ave. The creek can be seen on the right again where Chatham Ave meets Parkdale Road. Turn left into Parkdale Road. Turn right into Fontenoy Street, and then first right into Rawalpindi Street. Rawalpindi Reserve is on the right-hand side and provides access to the creek before it crosses Chamberlain Park Golf Course. Return to Rawalpindi Street, follow it north and turn left into Segar Ave and follow it until the end. After crossing the bridge over the motorway, turn right into Great North Road. Follow Great North Road for some time, but shortly after passing Premier Road on the left-hand side, look for a bridge that crosses the creek 30m before reaching Motions Road. Turn left into Motions Road and walk the left-hand footpath until reaching a path to a wooden footbridge. Cross this footbridge over the stream and follow the path to the right on the far side around the Pasadena Intermediate School and turn right to take the path up to Premier Road and follow it until the roundabout at the far end. On the far side of the roundabout walk down the path to the reserve at the far end. The creek is at the bottom of the slope of the reserve. Follow the path up to Moa Road and turn right. When you reach the end of Moa Road, turn right onto Meola Road and, after 100metres, cross over the creek on the road bridge, and just past the bridge is a path into Meola Reef Reserve. Walk through the park, keeping to the paths following as close as possible to the creek and still going roughly north until you reach the northern edge of the park. In front of you is Meola Reef Te Tokaroa, and to your left is where Meola Creek meets the Waitemata harbour. Sit and enjoy the view, you have earned it!